Once again working with an amazing group of people for a great cause. 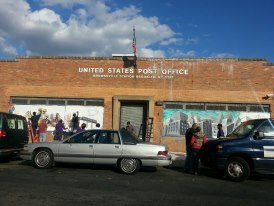 The Brownsville Post Office now has two new murals . 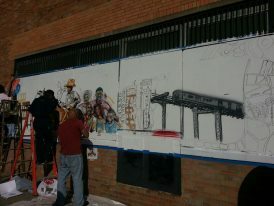 It was a pleasure, as always, collaborating with and painting alongside such talented artists. Thanks to Ralphy Perez for entrusting us with an amazing responsibility and for inspiring us all the way. Thanks also to all the residents who supported our work and allowed us to share their neighborhood and leave a little bit of us there. It takes ladders and a lot of coffee! This project was completed in two weekends. 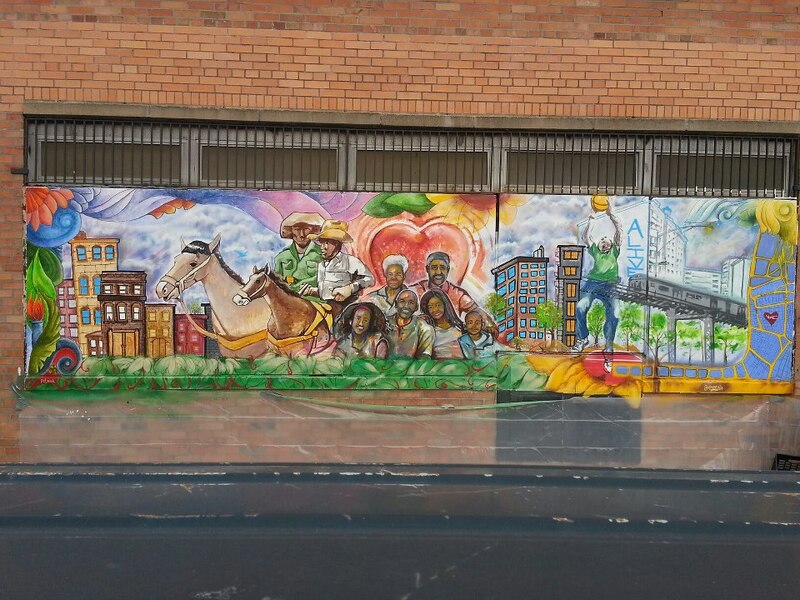 It incorporates aspects of the neighborhood’s architecture, street grid, people, culture and history. We wanted to make it as colorful and vibrant as the community itself. I was entrusted to design and complete the border which was exciting because I was happy to incorporate architectural details and organic shapes into the design. One of my favorite details is the collaboration with graffiti artist Sienide. A large and blooming sunflower turned into a springboard for a young basketball player reaching for the sun. Flowers, vines and leaves create a visual representation of the growth this neighborhood is going through and the beauty of it’s blossoming. 09 Nov	This entry was published on November 9, 2012 at 2:08 am. It’s filed under artwork and tagged art, arts, black cowboys, brooklyn, brownsville, brownsville post office, collaboration, eltrain, graffiti artist, mural, neighborhood, new york, organic shapes, pitkin, post office, public works, rockaway, sunflowers, xmental, Xmental u, xmental university, young basketball player. Bookmark the permalink. Follow any comments here with the RSS feed for this post.